The coarse and acrid tobacco plant has over the centuries undergone the long and slow process of selection. Out of the countless and varied attempts at cultivation certain regions have emerged with their soils, humidity, and with the warmth and strengh of the sun. Gradualy the patterns of an annual round of sowing, cultivation and harvesting has been established. So it is with careful nuture a seed weighing only a few miligrammes becomes in four months a plant taller than a man, with hudge dark green leaves which turn golden in the evening sun. The rules of harvesting, drying, and then the complex chemistry of fermentation transform the slightly furry and fleshy leaves into a bunt-brown tissue, supple and shiny, on which the veins hardly show, and which carries a haevy aroma. Leaves are assembled from a choice of provenance and leaf-level, bound in a fleshy and resiliant binder, formed according to a careful respected model, and then wrapped in a single pliant leaf which gives it its final appearance. Centuries of tradition and research have formed the cigar. then can the tobacco be harvested. - corona (leaf crown just underneath the flowers that grow at the top of the stalk). After harvesting the leaves are hung in bunches by their stems or stored in rudimentary shelters or drying houses. - volado: the very lowest leaves on the plant; tobacco is very mild and of weak intensity; undernourished. - seco: tobacco from the bottom or middle leaves of the plant; fairly mild; weak or middling body. - ligero: the better-nourished leaves from the middle of the plant; this tobacco has a certain degree of body. 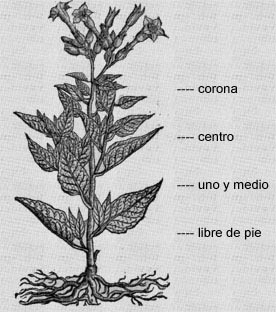 - medio tiempo: leaves from the upper half of the plant; tobacco with considerable body.